One thing is a certain every year, with children who are still growing, they will need new winter gear every year. It amazes me just how fast little kids sprout up actually. The snowsuit I bought last year seemed big at the beginning of the year and within the season it got too small! 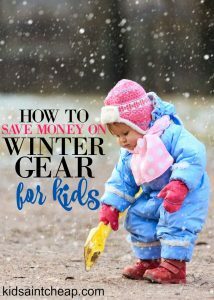 Winter gear, for us and probably many families out there, is one of the most expensive kid clothing expenses we have every year. The savings we get buying cheap $5 sandals and $2 shorts in the summer are quickly spent in the colder months but this doesn’t mean there aren’t savings to be found. I know I often say this, but the same still applies for snowsuits and boots. ‘’Shop’’ around for used. This could be either an older kid hand-me-down or shopping at a local thrift store. The first two years my kid was outfitted in winter gear we bought at a second hand store and were almost brand new. Kids grow so fast that they usually only get one winter out of the gear and my experience is that most parents will either look up unload or just donate to a local store. Last year our daughter wore a pair of quality winter boots that were also worn by two of her older cousins. The boots still had plenty of life in them and saved us a few bucks. Put a Facebook post out there and see if you get any bites. Also join local buy and sells on Facebook to see if you find anything decent and, as always, check your local thrift stores. You don’t know what’s out there until you ask! At the end of our daughters second winter we came into a too-hard-to-resist-sale on snow suits. They were name brand suits at a store for $10. We quickly bought a few and two years later we’re still wearing them (I have two more still to go!). I figured if, by the time winter came, they didn’t fit her and she was in between sizes, I would donate them to a thrift store or local charity. Things like snowsuits and boots take up a large inventory so stores often want to see them sell off rather than storing or shipping back (especially as style changes) so you may be surprised what is out there for sales. Winter boots can be expensive. I have been looking around for our 3.5 year old and found a few pairs, the problem is that I know they will only fit her for the one winter, and they were $50, or more, per pair. I can’t justify spending $50-$70 on a pair of boots she will wear for a few months. Instead I found a pair at Walmart. They seem to have a nice lining and super warm for half the price. Some people get so hung up on certain brands they don’t even consider large box store brands. If you walk into a sporting goods store looking to outfit your child for the winter, you can expect to spend a few hundred dollars but there is no reason why you can’t bring in a whole outdoor winter apparel for your kid for under $100. Like anything, there are always savings to be found if you try! 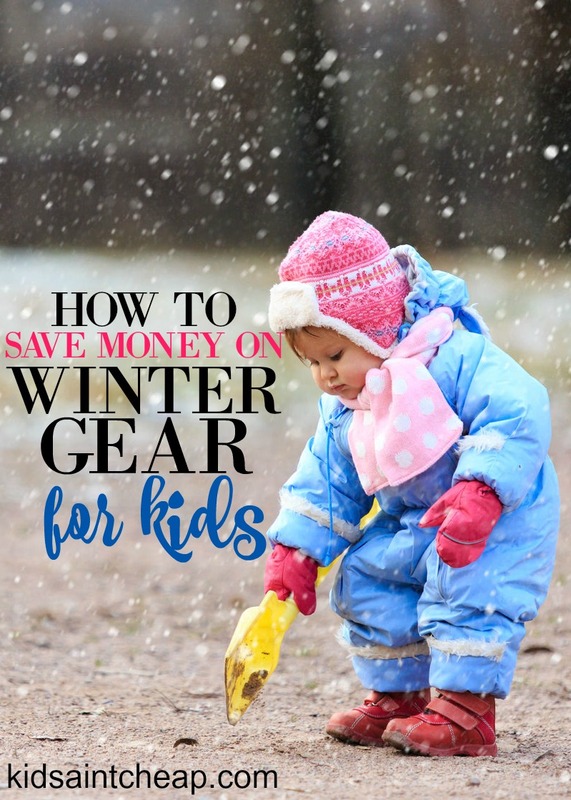 How do you find savings when it comes to outfitting your growing kids for winter?